Ok, I have the perfect excuse for hoarding fabrics and crafting supplies. The more you have the better. There is a wall behind these shelves. So let me explain how this provides us with the perfect excuse. I may have type-talked about this before but it won’t hurt to repeat it. Ok, how to explain it…. hmm…..
Have you ever heard of filling a freezer with jugs of water to take up space so your freezer doesn’t have to work so hard to keep things frozen? Or have you heard of filling a jug of water and putting it into the toilet tank so you use less water with each flush? Ok, good. Imagine you have a very empty room. The furnace kicks in to warm the room or the air conditioner starts to cool it. The smaller the room the easier it is to heat or cool it and thus cheaper. For easy math, imagine the room is 100 cubic feet of empty space. You would be heating or cooling 100 cubic feet of space… right? Ok, so you put a shelf unit and 10 cubic feet of fabric in the room. This means you are now only heating and cooling 90 cubic feet. Put 50 cubic feet of stuff in there and your furnace or air conditioner is only heating or cooling the remaining 50 cubic feet. ALRIGHT!!! now i have the PERFECT reason for hoarding and stashing “stuff”.. i LOVE IT. Therefore i do NOT have to clean out this “library”.. all the stuff is INSULATION and is helping my furnace work more EFFICIENTLY.. YEAH. i can’t WAIT to tell Darling David.THANKKKKK YOU SOOO MUCH.!! 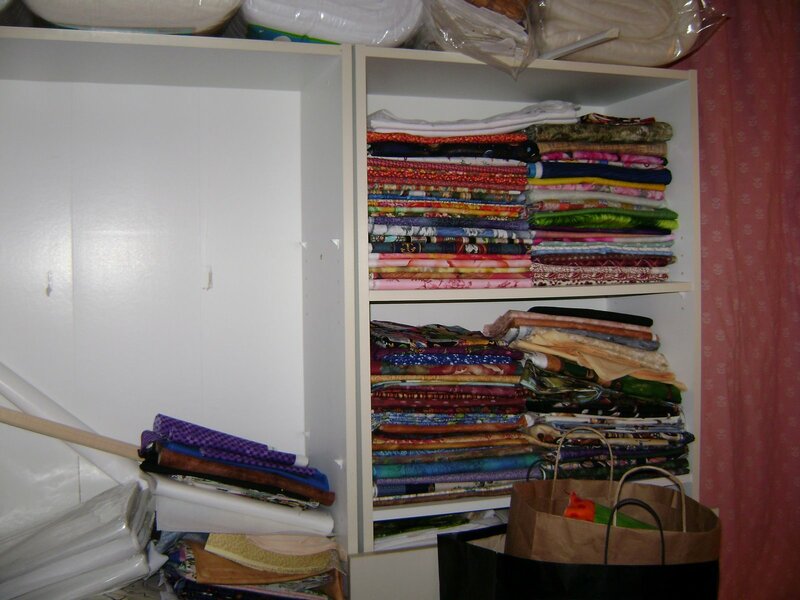 This entry was posted on March 22, 2009 by Anita in ENERGY SAVING IDEAS, HUMOR, QUILTS - ORGANIZING, QUILTS - STASH BUSTING.